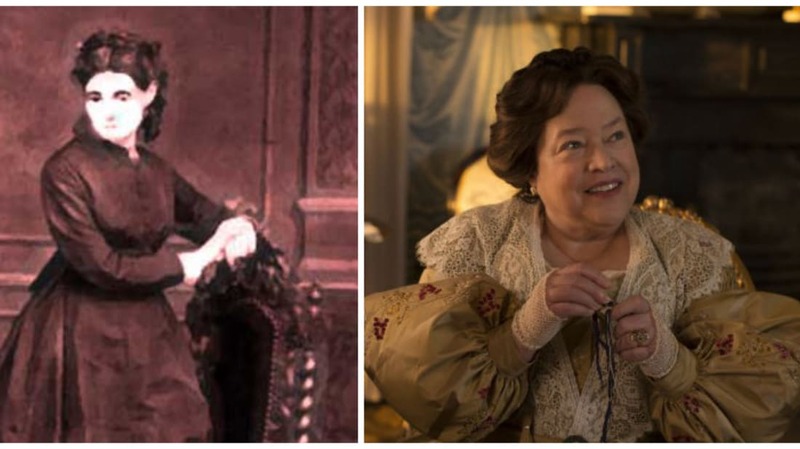 I think we can all agree that Kathy Bates is terrifying when she puts her mind to it. If you watched American Horror Story: Coven, she was undoubtedly the cause of a few chills down your spine. In case you didn’t see it, she plays Delphine LaLaurie, a character Bates has called “five times worse” than Annie Wilkes from Misery. And here’s the true spine-tingling part: Bates’ torture-happy mistress was based on a real person. Marie Delphine LaLaurie was a thrice-married New Orleans socialite in the early 1800s. Like many wealthy southerners of the time, the LaLauries had household slaves. Though it had been long-rumored that the slaves were treated cruelly, even for the era, the final straw came in 1833, when a young slave girl named Lia (or Leah) was brushing Mme. LaLaurie’s hair and accidentally hit a tangle. Outraged at the abuse of her tender head, Delphine chased the poor girl around the house with a whip. The chase ended on the roof of the mansion, where Lia was driven to the edge by the whip-wielding lady of the house. Forced to choose between a flogging or a leap, Lia chose the latter and died when she smashed into the stone courtyard three stories below. It’s said that her body narrowly missed hitting a man who was entering the house; the man reported LaLaurie to the police. After the girl’s body was found in a well on the property, the household was fined $300 and had to sell their slaves. The poor slaves who thought the nightmare was over were wrong. Madame LaLaurie simply gave an associate the funds to purchase her slaves at auction, then had them promptly returned to the house. In 1834, one of the kitchen staff purposely set the building on fire, hoping that outside help would arrive. She wasn't disappointed. When firemen showed up, they found a 70-year-old kitchen slave chained to the stove—she had obviously decided that risking death by fire was preferable to remaining in the “employ” of her sadistic mistress any longer. The woman pleaded with the firemen to rescue slaves from a room in the attic. When the men got upstairs, they had to knock the attic door down with a battering ram—and what they found inside actually made some of them vomit. Legend has it (and it is very likely that the stories were embellished over time) that there were slaves with their eyes gouged out. Slaves with their limbs amputated. At least one had her skin peeled off. Many of their mouths had been sewn shut, sometimes with animal feces inside. One woman’s limbs had been broken, then reset so that she resembled a “human crab.” And the worst part—most of them were still alive. While it’s hard to say how many men, women, and children suffered at the hands of the LaLauries over the years, some accounts put it at 100 or more. When word got out, an angry mob—some reports put the number at 4000—congregated outside of the LaLaurie residence and over the course of the night and the next morning systematically destroyed most of it. Sadly, Madame LaLaurie and her husband managed to escape by coach before anyone could bring them to justice. No one really knows what happened to them after that. Most accounts say the couple made their way to Paris, where they lived for the rest of their lives. But others say they simply moved to a different part of the state and acquired more slaves, or even stayed in New Orleans under assumed names. So, while Kathy Bates was quite terrifying even just one episode into American Horror Story: Coven, the true horror is that those Mengeleian experiments might have been real. Oh, and if you took note of the little Nicolas Cage reference in the show and wondered what that was all about, that’s also based in reality. Cage purchased the house of horrors in 2007 for almost $3.5 million. It was foreclosed in 2009.